Hello my Friends. I have one card to share with you today. For my inspiration today i have this gorgeous image by Anna Marine "Veil", at Sweet Pea Stamps. 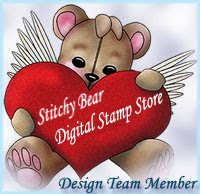 You can have this image in Rubber stamp or Digital image. My embellishments on this card made with Dies and coordinated stamps from Heartfelt Creations. Oh Nataliya, this card is soooo gorgeous,love how you did the pink and yellow background it makes that beautiful image just pop, its stunning really. The papers in back are very lovely,beautiful ribbon and the sparkle on the flowers are gorgeous, thanks for sharing and have a wonderful day..